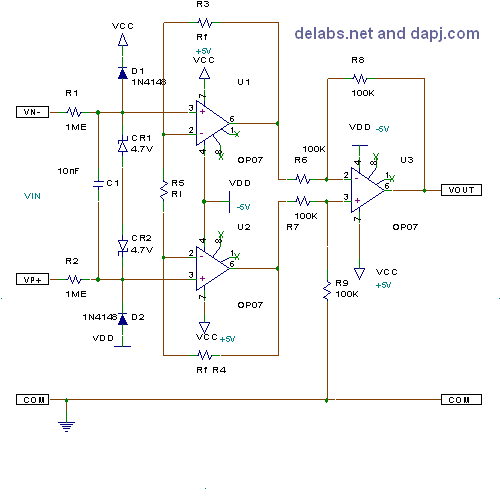 Instrumentation Differential Amplifier using Three Op-Amps, Slide the Potentiometers and vary the mV Source, See Output DVM. This is close to the Ideal Instrumentation Amp, High Z and Excellent CMRR. Web widgets related to learning electronics and also demonstrating the subtle aspects of Product Design Technologies. The delabs iGoogle EE Widgets will work here till the Google Sites Transition to New Google Sites. This blog also has the widgets made by delabs from the iGoogle days, around 2005. These demonstrate solutions for improving usability in devices. The code has been moved from my Google Code Hosting account.